Create a heavenly retreat in your yard or garden with our LuxCraft Cutout Heart Double Lawn Glider with Roof. You choose either a cedar roof or an open lattice roof for this special Amish glider. Supply the centerpiece for outdoor seating with this unique Amish glider that will seat up to four people as they swing and relax at your outdoor functions. This wooden swing is made of pressure treated kiln dried yellow pine wood to ensure longevity. Be sure to review our collection of Amish Outdoor Benches to add to your outdoor display. Call one of our Amish Furniture Specialists today at 1-866-272-6773 with any questions and be sure to visit our blog for more outdoor seating ideas. 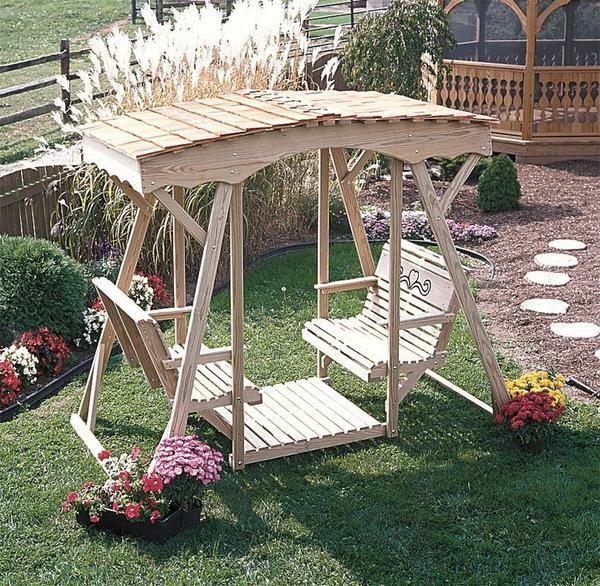 The roof of this Amish glider comes assembled as well as the sides, swings and floor. There are instructions included on how to put these parts together to fully assemble your double lawn glider. Approximate Weight with Pallet: 580 lbs.